As we drove up to the baseball field the wind blew in from the northeast. The shamal blocked out the sun and sand filled the air. But the game wasn’t cancelled. I consoled the kids. Actually it’s been quite a year for Ace, Mark and Susan’s baseball team. 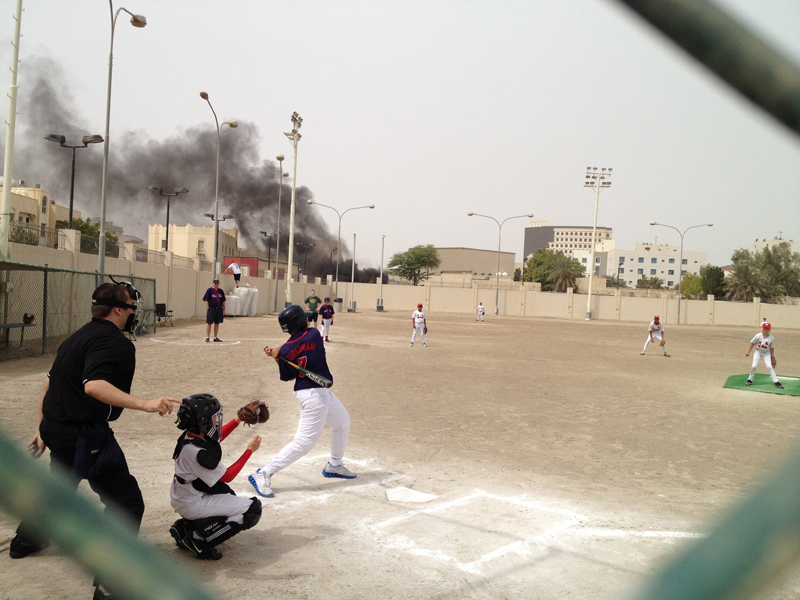 Baseball is NOT Bahrain’s national sport. 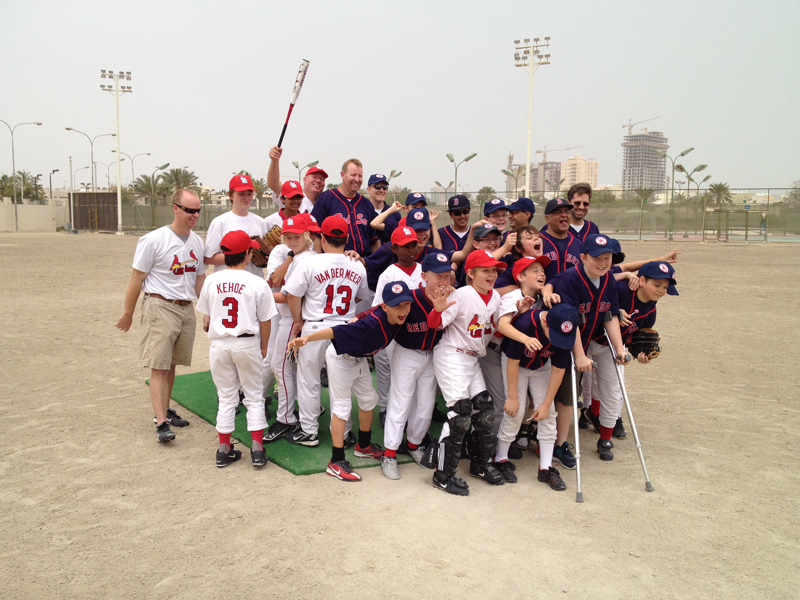 However, the season began with enough kids for three teams in the Minor League. The third team folded within a few weeks as players and coaches quit coming to practice. Tires burning behind the baseball field. The two remaining teams played each other 22 times this “season” amidst burning tires and tear gas. Often they spent hours on the road as traffic was diverted by political demonstrations. 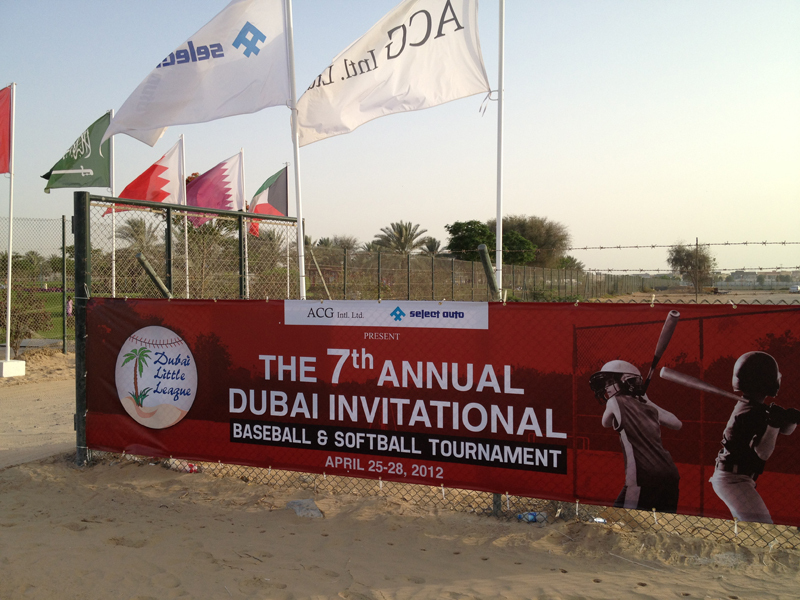 For the top fifteen players, going to Dubai for the Little League Tournament was the highlight of their year. 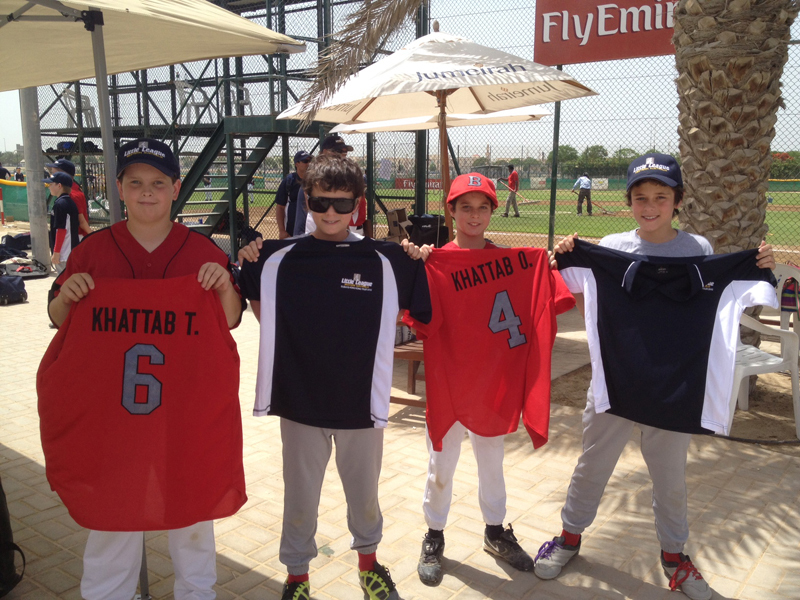 Saudi Arabia, Kuwait, Qatar and Dubai each fielded two teams of their top players and for the first time, three teams from Perth, Australia showed up. 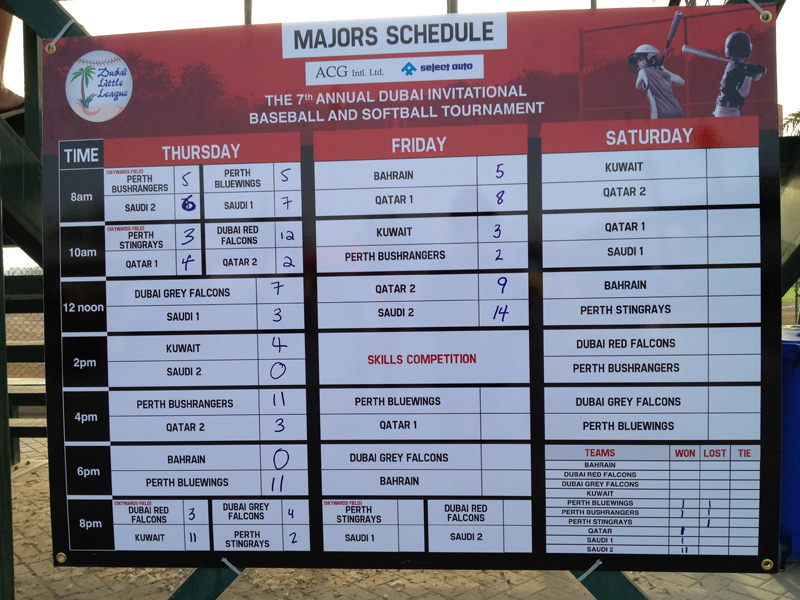 The Bahrain team played their hearts out and endured despite some tough umpiring. They lost all their games to Dubai, Qatar and two of the Perth teams. After forging ahead, the Perth teams recognized they had the upper hand and in both games they displayed good sportsmanship and eased up. They quit stealing bases and called in their back-up pitchers. They still won by a huge margin but they did not completely trounce our younger, less experienced team. And as they shook hands after the final game, the Perth coach told our kids that they heard about what had been happening in Bahrain. They wanted to remember them and asked if they could trade jerseys. Our team eagerly traded their red jerseys for the Perthian blue and white. The next morning they all went to the Wild Wadi water park together. The trip ended with heart-felt hugs and promises to see each other at next year’s tournament. Despite the losses, it was a perfect life lesson in sportsmanship, playing for the love of the game and the camaraderie of team sports. Good to see you at your book launch last night and glad to see that it was such a huge success. I read Miss Leathers and the Pink Hummer last night – loved the engaging style and the lightness in telling. Miss Boom Ching was certainly a Bahraini I am sure I have seen on the roads or at roundabout places and I am happy to hear that Ali actually paid his fine for he is in the minority! You did confuse me about the Cressida which morhed into a Corolla and the bit about the break in the brake but then at my age I am easily confused. Your author’s group sounds like a good crowd – alas if I had hearing I would join it – and again congrats on your accomplishment. You have certainly led an interesting and varied life! Hence the need for a good editor. It was a fun night. And yes the Bahrain Writers Circle is great fun. Thanks for reading it and reminding me how difficult it is to get a perfect peace – I mean piece.